It seemed fitting to close out this HOT summer in flames. 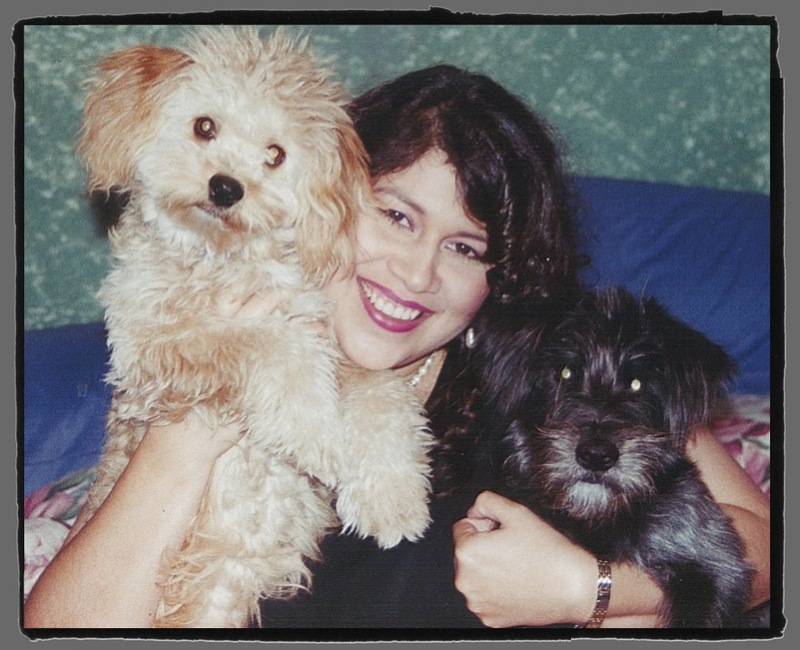 Andrea and the wonderful Miss D from I Love Schnauzers shared the Blog on Fire award with Agujas. When I came across I Love Schnauzers, I was hooked. Andrea knits a little bit of everything and makes the cutest doggie sweaters – and Miss D is the perfect model. Thank you Andrea and Miss D for heating up my day! The rules are to share 8 unusual things about yourself (or your pet) and then share the award with 8 other bloggers who are on fire! Since this honor was bestowed by a line of dog lovers, most of them wrote about their pets, so I will too. My pets have been gone a long time, so this is in memoriam. Despite their spirited names, Tequila (terrier-schnauzer mix adopted from the SPCA) and Vodka (blonde pomapoo adopted from friends) only imbibed non-alcoholic beverages. Tequila liked his on the rocks. Give him an ice cube and he would slip and slide all over the kitchen floor chasing it until he crunched it all up. Tequila was the athletic type – extremely agile and fast. He could jump 2-3 feet into the air like a jackrabbit on steroids. Tequila had cat-like qualities. He could jump onto the sofa or bed without making a single sound. Vodka was the dreamer. He would follow Tequila faithfully on their romps but was easily distracted. He would give chase to butterflies and then look around in panic when Tequila was out of his line of sight. Vodka would nudge his nose under my hand until he was nestled under it so that I could rub his neck. Vodka was clumsy. If he ran too fast, his short legs would give way under him and he would run into things. They were mischievous. Once I left them in the backyard to get fresh air and sunshine. Apparently, they broke out of the yard and roamed the neighborhood because when I drove up to the house, there they were both sitting at the front door with very guilty looks on their faces. Here are Tequila (black-bearded fella) and Vodka (blondie). DISCLAIMER: This picture was taken a LONG time ago. In the spirit of these blog awards, here are 8 blogs that are on fire that I encourage you to visit. 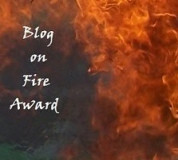 And to end summer on an even lovelier note, thanks to Seascapes AUS for sharing the One Lovely Blog award with Agujas. Since this honor was already bestowed, I just want to say thanks and encourage all of you to go see the lovely paintings of the sea. < What are your favorite knitting apps? Yes, they do. They become part of the family. Thank you very much for sharing the love. I am honoured. Tequila and Vodka were clearly very special souls. And very funny ones. You are most welcome. I still remember them fondly. They usually put a smile on my face, usually. I really enjoy reading these blogs. I’m sure you have plenty of stories about Miss D! Thanks for the award! I will be passing it on soon! You are welcome. I have really enjoyed reading your posts. I love the way you have incorporated your quilts into teaching. I’m sure it leaves a strong impression. thanks for dropping my my blog – where do you live that you have had a long hot summer? Missed out on that in the UK – again! I’m in good ‘ole Texas. It has been hot, hot and muggy in East Texas. But we have been blessed with rain while other parts of the country are going through a drought. Thank you for the award and the list of new blogs to check out ! You are welcome. I love your crafting ideas. How cute Tequila and Vodka were!! It’s amazing how are pets become members of our family. Thank you so much for the award and the great list of blogs to check out, here I go! They were quite precious. You are very welcome and I’m glad you are liking the other blogs as well. Take your time. Enjoy the blogs. I’m sure you’ll enjoy them. They are adorable. I just got a puppy–a lot of work, but so worth it! I, too, am from TX and enjoyed browsing your blog. Thank for stopping by mine. What kind of dog did you get? Didn’t realize you were a fellow Texan! I liked the crochet doily you made. I haven’t tried crocheting with lighter threads, just yarn. I keep thinking I should make a crochet bedspread – the kind my grandmother used to make. I should start with a doily! We got a standard poodle. I grew up with them and so am familiar with the breed. Our best friend, Blaze the dog, died in May and we’ve been very lonely without a dog. Apollo, our new puppy is a handful–haven’t had to deal with a puppy for the last 10 years–but I swear he is keeping us young 🙂 I was born in TX (Ft. Worth) and also lived in Houston for 12 years. Pennsylvania is a great state, but you just can’t take the Texan out of the girl!! Regarding your comment to start with a crochet doily–when I first started crocheting I was advised to start with wash towels–nothing big. I saw no sense in it and immediately started crocheting afghans. If you want a crochet bedspread–go for it! I love to knit and crochet, but I find crochet moves much faster and is much more forgiving.